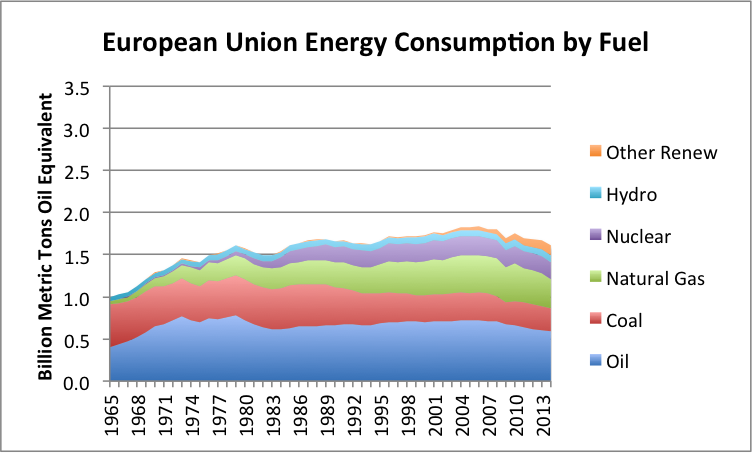 One of our underlying problems is that energy costs have risen faster than most workers’ wages since 2000. 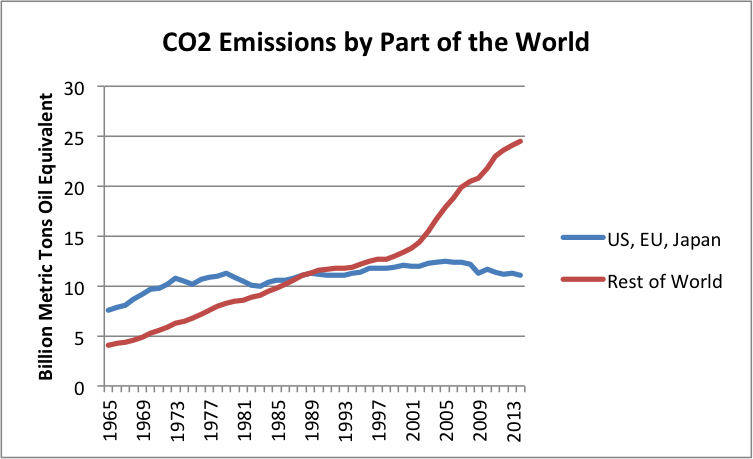 Another underlying problem has to do with globalization. 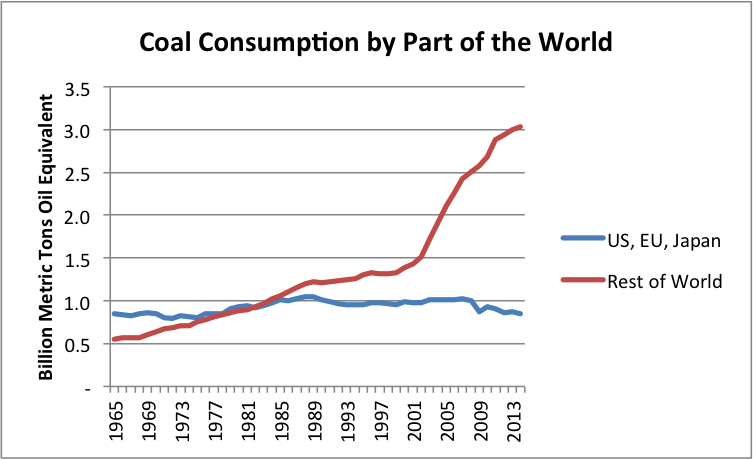 Globalization provides a temporary benefit. In the last 20 years, we greatly ramped up globalization, but we are now losing the temporary benefit globalization brings. 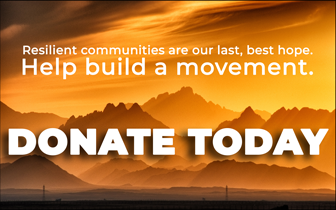 We find we again need to deal with the limits of a finite world and the constraints such a world places on growth. Figure 4. 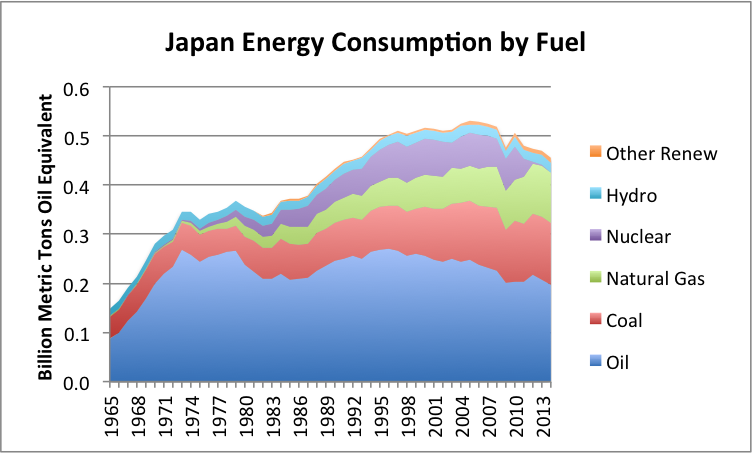 Japan energy consumption by fuel, based on BP Statistical Review of World Energy 2015. 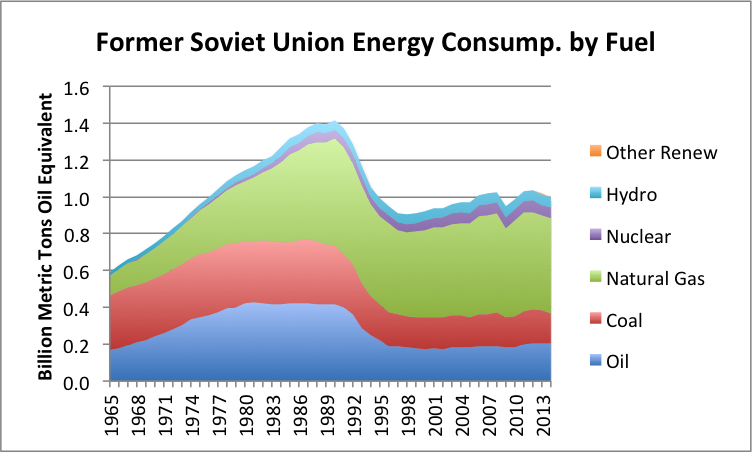 A third area with slumping demand is the Former Soviet Union (FSU). The two major countries within the FSU with slumping demand are Russia and Ukraine. 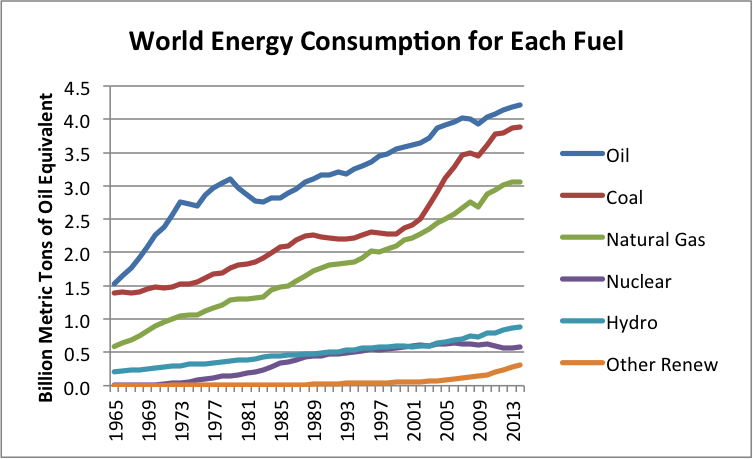 To a significant extent, the US’s slowing energy consumption is intended–more fuel-efficient cars, more fuel-efficient lighting, and better insulation. 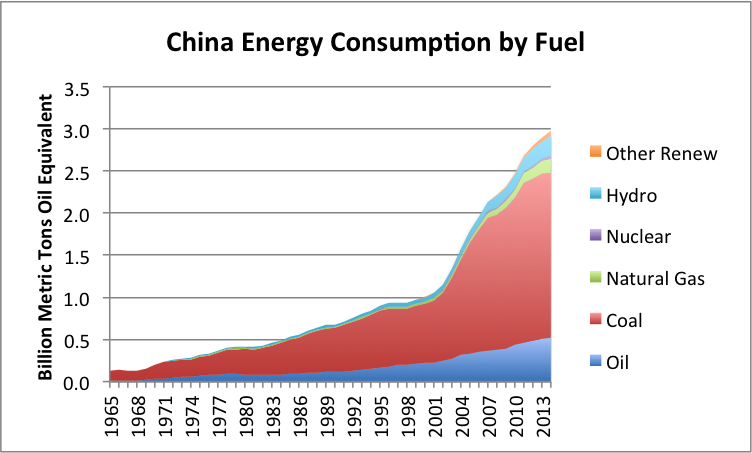 But part of this reduction in the growth in energy consumption comes from outsourcing a portion of manufacturing to countries around the world, including China. Regardless of cause, and whether the result was intentional or not, the United States’ consumption is not growing very briskly. 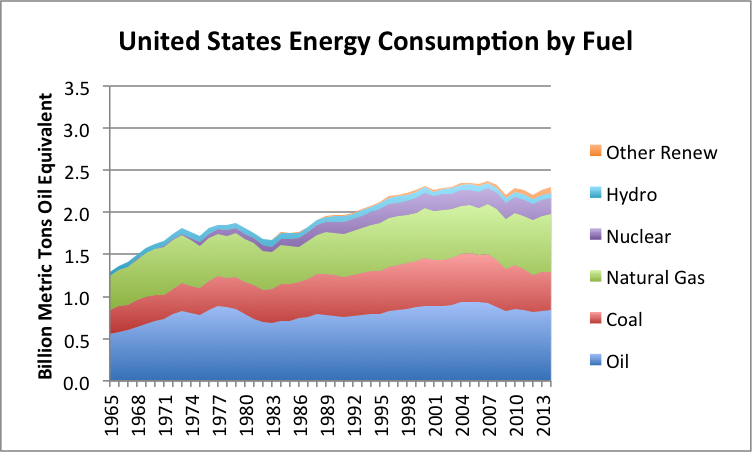 Figure 6 shows a small uptick in the US’s energy consumption since 2012. This doesn’t do much to offset slowing growth or outright declines in many other countries around the world. 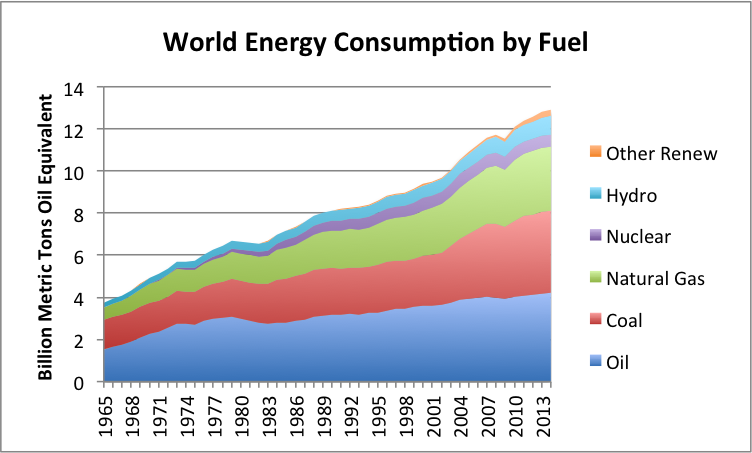 If oil producers had planned for 2014 oil consumption based on the recent past growth in oil consumption growth, they would have overshot by about 1,484 million tons of oil equivalent (MTOE), or about 324,000 barrels per day. 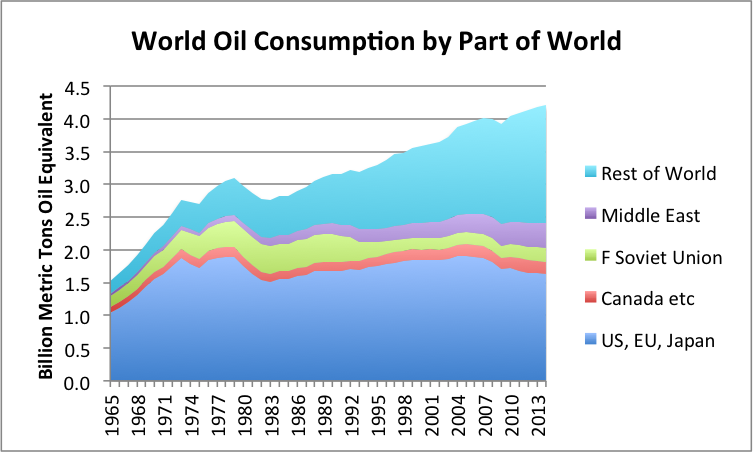 If this entire drop in oil consumption came in the second half of 2014, the overshoot would have been about 648,000 barrels per day during that period. Thus, the mismatch we have recently been seeing between oil consumption and supply appears to be partly related to falling demand, based on BP’s data. It stands to reason that if prices of commodities are low, while the general trend in the cost of producing these commodities is upward, there will be erosion in the amount of these products that can be profitably produced, and hence, that can be purchased. (This occurs because prices are falling relative to the cost of producing the goods.) 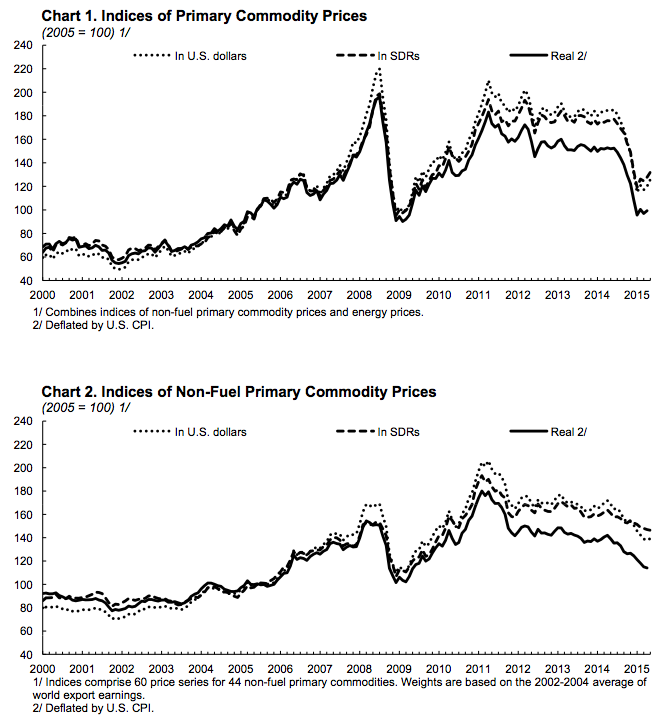 If, prior to the drop in prices, consumption of the commodity had been growing rapidly, lower prices are likely to lead to a slower rate of consumption growth. If prices drop further or stay depressed, an absolute drop in consumption may occur. 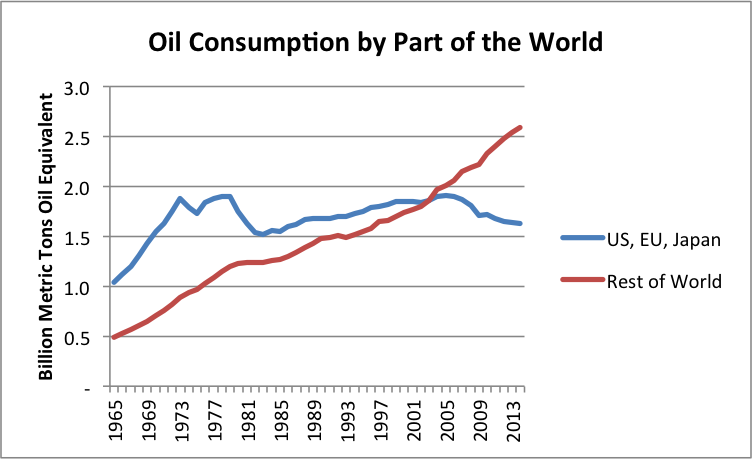 If the price of a commodity, say oil, is low, this is a problem for a country that exports the commodity. The big issue is likely to be tax revenue. Governments very often get a major share of their tax revenue from taxing the profits of the companies that sell the commodities, such as oil. If the price of oil or other commodity that is exported drops, then it will be difficult for the government to collect enough tax revenue. There may be other effects as well. The company producing the commodity may cut back its production. If this happens, the exporting country is faced with another problem–laid-off workers without jobs. This adds a second need for revenue: to pay benefits to laid-off workers. 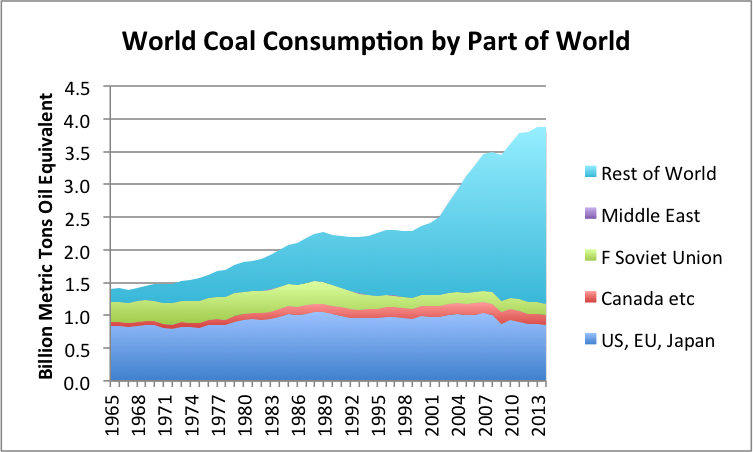 Figure 1- Resource consumption by part of the world. Canada etc. groupng also includes Norway, Australia, and South Africa. F Soviet Union means Former Soviet Union. Middle East excludes Israel. 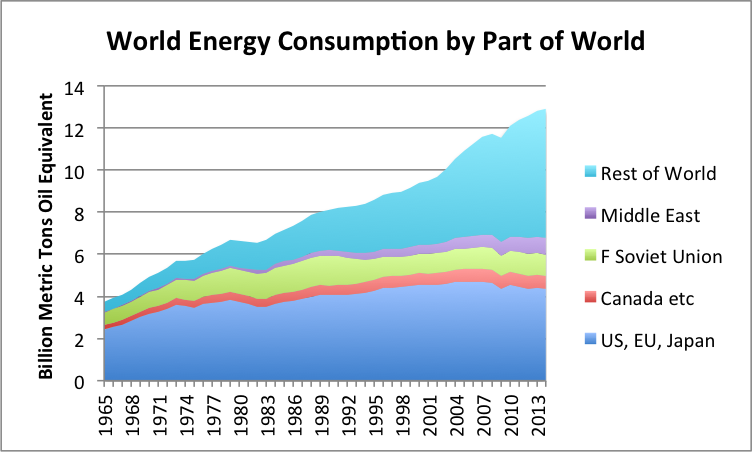 Based on BP Statistical Review of World Energy 2015 data. It seems to me that we are reaching the limits of globalization now. This is why prices of commodities have fallen. With falling prices comes lower production and hence lower total consumption. Many economies are gradually moving into recession–this is what the low prices and falling rates of energy growth really mean. Is Trade in Turmoil a Change for Justice?